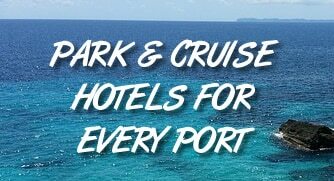 Sailing to Cozumel on your cruise? Chances are that you’ll be using a taxi at one point or another. While the main cruise piers are near the main city, it’s still too far to walk unless you’re in pretty good shape. And if you want to go to many of the attractions or resorts on the island like Mr. Sanchos, Chankanaab, or Nachi Cocom, then you’re definitely going to need a cab. They are too far to walk. To make things easy on cruise passengers unfamiliar with the area, Cozumel offers set rates from the cruise piers to the tourist areas on the island. This makes it simple to know how much you should pay and keeps you from getting fleeced by a taxi driver. You can find rate tables displayed near the taxi pickup area as you leave the port. Rates are set for three groups: 1-4 passengers, 5 passengers, and 6-8 passengers. So if you are traveling with two people, you will pay the 1-4 passenger rate shown below. — NOT double the rate. That said, our opinion is that the rates shown are still too high. For instance, a ride to Chankanaab takes roughly five minutes, but costs $12 for 1-4 passengers. That’s simply the price you pay for being a tourist. Note that rates are in U.S. dollars. A small tip (10-15%) is considered polite. Credit cards are not accepted. You’ll need to bring cash. Here are the rates from the other pier (the more northern of the two piers). Yep – and here’s what we ran into: we, and another couple got into the cab. We all went to Paradise Beach Resort. Cabbie could see we didn’t know each other, and charged us EACH the $12 dollar 1-4 passenger rate. He got $24 for that 5 minute trip. SO – make nice with the people your standing in line with. Chances are you’ll get into the same cab and if you’re “old friends” going to the same place, the 4 of you will split that $12 rate, and not be charged double. Thanks for the comment. It definitely helps to share a cab and we also highly recommend taking your own picture of the fares to be able to show that the rate is $12 for 1-4 passengers. When we were in Cozumel in January, we took a taxi from the Mega store in downtown to a restaurant (Pescaderia San Carlos) and I’m fairly sure that we were only charged $4 for the ride. So if you can get outside of the pier, you will probably pay less. Not sure how well that will work at the International Pier. We were docked at the Punta Langosta pier so we walked to downtown. Do you have to pay the taxi drivers in pesos or do they take USD? They gladly take dollars. It’s a smart idea to bring correct change. 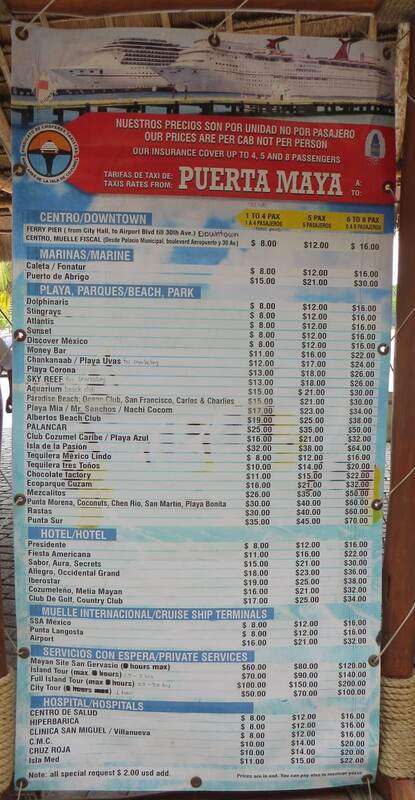 Are the prices shown in pesos or USD $? I have been stiffed so many times by taxi drivers. Last time charged $31 dollars from port to Paradise. It was posted $21. Got on cab with others and we both got charged same base gate that was posted. I don’t know how to get out of paying the erroneous charges! Take a photo! A snapshot of the taxi rates is a lifesaver in these situations.